There are a lot of different ways to think about how groups of numbers work together when you’re learning multiplication. You can think of them as groups, as numbers being added together, as an array and more. It also has a place for them to write the full multiplication sentence. 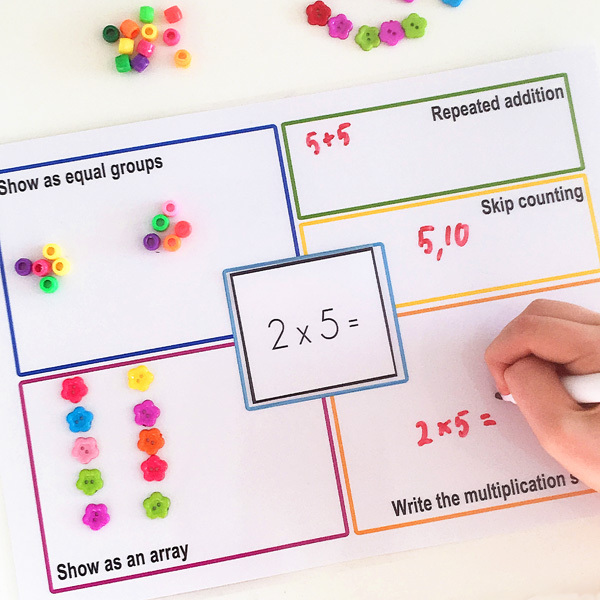 Print out the mat and laminate it or stick it in a plastic sleeve so you can write different multiplication problems on it for your kids to work through, or grab her multiplication cards printable along with her multiplication bingo game. This is a great way to reinforce math facts and make it a little more fun for kids. Do you have any tips for teaching multiplication? I think we’re going to work on it this summer!